When you love someone, you've gotta trust them. There's no other way. Author Pat Kirkham discusses the opening titles for Casino, from her authoritative book Saul Bass: A Life in Film and Design. "I was so touched that they had understood the writing; that they knew what the film was trying to do. There must have been a hundred Hollywood films about Las Vegas that have tried to capture the essence of that city, but none quite like this. Part of the brilliance of the Bass opening is that their project is so clear. Elaine and Saul have found the perfect metaphor for the film as a whole – for Las Vegas in the 1970s, and for descent of the Mafia into Hell." The Bass titles for Ocean's Eleven (1960) also featured Las Vegas, but as soon as they read this script they knew the sequence would have to be very different. As in Goodfellas, the titles do not open the movie. 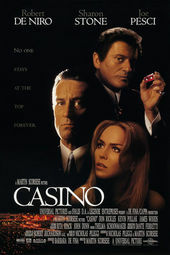 They follow the first scene in which Ace Rothstein (Robert De Niro) leaves a casino and gets into his car, turns on the ignition and the car blows up! At that moment the title sequence begins. Saul described it thus: "Think of Dante's Inferno and Hieronymus Bosch, set against Bach's St. Matthew Passion, and you begin to get an impression of what we're after." In Saul and Elaine's vision, Ace's body, or soul, rises and falls within a fiery Las Vegas purgatory. Between his ascent and descent, the flames dissolve into a montage of surreal neon lights that capture the city's throbbing assault on the senses. In the sequence, the main character's excess energy and flashiness are rendered simultaneously distorted and hyperreal, repulsive and desirable, not unlike the strip of casinos itself. The result is a work of startling visual poetry. There could be no more befitting finale for the greatest film title designer of the century, or a more moving elegy to his long and fertile collaboration with Elaine.